Chiriqui Libre April 15 2009 Edition. There are two ways to look at giving. First the donation directly helps someone in need and secondly it also benefits the person giving the donation. A good case in point is the quilt currently on display in the window of the Don Bosco Pharmacy in Volcan. This 30 panel, “sampler” quilt measures about 8 feet by 6 feet and proceeds of the raffle will help women’s health issues in the Volcan area. For the quilters, Nina, Maryanne, Lynn, Wendy, Janet, Nancy, Olivia, Carmen, Rachel, Dalys, Dana and Rocio it has been a one-year labor-of-love. Marianne Brown with Friend Nina Stephens founded the group in February 2008. There were several reasons: they wanted to learn something new, there was the obvious wish for companionship and finally they wanted their hobby to benefit women less fortunate than themselves. The group meets once a week and I am sure new members would be warmly welcomed. The quilt’ s many panels have been individually sewn and assembled by the group. They estimate that a quilt of this size and complexity would have a value of around $800 to $1,000. Marianne Brown tells me that some quilts can fetch up to $8,000. 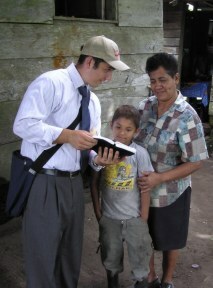 The group is an even mix of both Panamanian and North Americans. Fortunately for the linguistically challenged ex-pats their Panamanian women friends have a good grasp of the English language. On the day I arrived it was obvious that this was something that everyone enjoyed. As I climbed the stairs to the loft area that serves as their workroom I was greeted by peals of laughter. The sense of humor of these women is reflected in their unofficial title of, “The Chiriqui Sew and Sews.” I didn’t dare to ask if the name might be spelled “So-and-So’s” as there were too many women there with sharp objects in their hands. 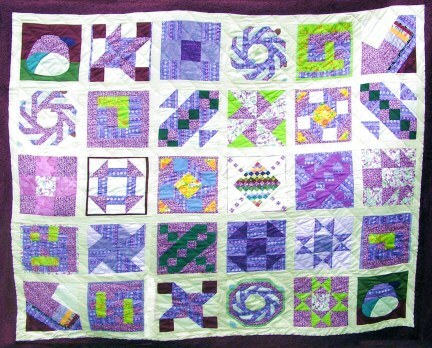 The quilt is being raffled on May 10th and tickets can be purchased from any member for $1.00. The final quilt will come with 1 accompanying pillow. The extra blocks not used in the quilt were made into quilted pillows and will be awarded at the raffle. All the materials for this quilt were donated by the group and currently the “Sew and Sews” are working on a new charity quilt. Although Panama has an adequate social medicine system, many women in the indigenous population lack education and resources particularly in the reproductive field. If the proceeds of this quilt can bring an equal amount of joy into some unfortunate women’s life, as went into the making of it, then I feel our local community will be well blessed. Please give generously. 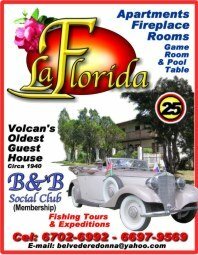 Tickets are also on sale at Daly’s Restaurant at the southern entrance to Volcan and at other businesses in town. THE MYSTERIOUS CAVE OF PORTON. We didn’t expect that we would find gold at Porton (we didn’t) our only hope was that we could come away with some stunning pictures of the reported large cathedral type caverns there. 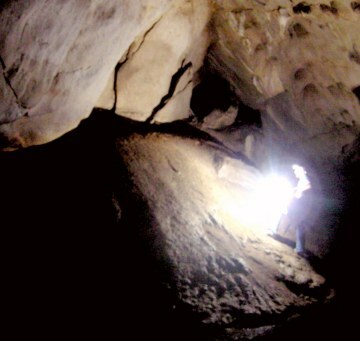 Juan had told us the only safe time to explore the caves was in the dry season. 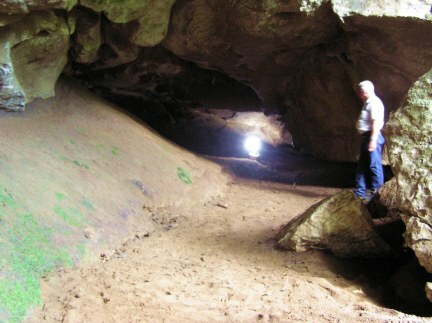 The cave could be flooded in the wet season and a mixture of bat droppings and wet weather can cause a fatal condition known as Cryptospirosis. I had heard a story about two men who had taken refuge from a rainstorm in a cave near Boquete. One died that night and his companion died two days later. With this rather disturbing knowledge tucked away in my head, we set out. 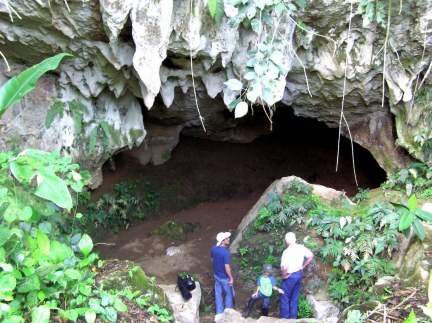 To reach the Porton cave you head toward the border at Paso Canoa. About a mile after you pass through the Customs checkpoint look to your right for a large white arrow with the words; REFORESTAL AL TECAL, written on it. Follow the paved road for 8.6 miles until you reach the FERTICA “calica” quarry and here you park your vehicle. The cave is just a few hundred yards from here but first you should ask the people at FERTICA for permission to cross the land. They are a decent company and if you promise not to dump trash or damage anything, permission is usually given. Walk to the right of the factory and descend along a dry riverbed toward the nearby hill. Follow the riverbed and soon you will reach a large boulder wall and climbing to the top you will get your first view of the cave. The mouth is 30 feet or so across and 20 feet high. The cave winds into the darkness to your right along a wide sandy floor. For a hundred yards the headroom is about 4 feet, but don’t worry you don’t have to crawl through any wormholes. Then you reach the first wide chamber. From here you have to clamber up a small rise and then you enter the first cathedral-type chamber. This about 50 feet across and 30 to 40 feet high. We were dive-bombed by a dozen or so bats that flew within inches of our face. I think they were excited by our lights, nobody was bitten. 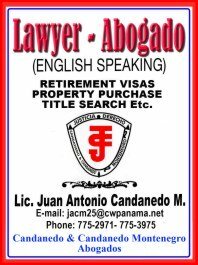 English speaking visitors and residents of the highlands of Panama, have so far lacked for nothing. Volcan and the nearby city of David have provided almost all the needs of life from first world shopping to medical care. However, there was one part of highland life where English wasn’t available and that was in the field of religion. 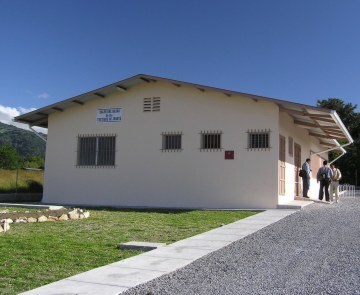 The Watchtower Society, the organization that governs the religous body known as Jehovah’s Witnesses has seen the need to offer weekly services and free Bible studies in English to the communities of Volcan, Boquete and David. For many of us, old age and ill health have caused us to wonder what happens next? Is there a God. Do I go to heaven when I die? Am I going to be punished in some fiery furnace for the errors I made in my life? Your local congregation of Jehovah’s Witnesses can give you clear, definitive answers to these and many other questions – and their answers will come directly from the Bible. It is arguable that the group formerly known as the International Bible Students is the most persecuted religious group since the start of the 20th Century. During World War II Hitler swore that he would eliminate them. Not only were Jehovah’s Witnesses imprisoned in Nazi Germany but at the same time they were also sent to jail in Britain, Canada, Australia and the United States for their beliefs. The persecution continues to this day in many countries around the world. The Witnesses are quick to point out that their leader is Jesus Christ who they say is the only son of God, and not part of a trinity of gods. Their version of the Holy Bible is called the New World Translation of the Holy Scriptures. God’s personal name is written in the Bible nearly 7,000 times, yet some religious groups have felt it necessary to remove it from their translations of the Holy Book. Jehovah’s Witnesses believe this would be equal to someone compiling the complete works of William Shakespeare but removing Shakespeare’s name and inserting the title: “Great Author.” Jehovah’s Witnesses believe the greatest author of all-time should be honored and named in his book – the Bible. A surprise for many people is to discover that most of the Witnesses have no hope of going to heaven. They believe their destiny lies in living forever on a paradise earth. They will be just as quick to point out that neither they nor anybody else will suffer everlasting damnation in a fiery hell. Again, they point to Holy Scripture to back up their claims. Each month they print and distribute over 146 million copies of the Watchtower and Awake magazine. This worldwide distribution is done non-commercially. The Watchower Society has been a world leader in the distribution of religious books and pamphlets for more than a hundred years, so much so that they are even listed in the Guinness Book of World Records. Visitors to their meeting place, which they call a Kingdom Hall, may be surprised by the absence of crosses or religious symbols and they will never see statues of any saints, Jesus or the Virgin Mary. During their meetings no collection plate is ever passed although there are voluntary collection boxes at the rear of the hall, to cover lighting, maintenance and construction costs. REIKI: The Ancient Healing Art. Reiki is one of the healing art forms. It generally translates to "Universal" life force energy. It can be called the bodies energy field or subtle energy. The energy field that surrounds the entire body is called electromagnetic energy. It has been used for centuries in countries such as India, Japan, China, Egypt, Greece and Rome. Unfortunately this knowledge and healing was kept from the masses for centuries and preserved by holy people such as priests and spiritual leaders. The mystery schools were also instrumental in preserving the knowledge. Not until the turn of the century was it brought back and used for the masses. Once a person takes first level of Reiki their channels are opened and healing energy starts to come through one's hands. Reiki is a holistic practice that brings homeostasis or balance to the body. This is on a emotion, physical and psychological level. The practitioner is the channeler for the energy to pass to the body. The body in turn will take that energy and use it where it is needed. This tells us that the bodies inherent wisdom is much more than most of us realize. In doing a session it leaves the practitioner strengthened and balanced also. No particular religious faith or belief is needed as it has nothing to do with spiritualism or the occult. Anyone from any faith, religion, walk of life or free thinking can become a practitioner or use the energy. Even those with different philosophies and ideologies benefit from Reiki. How It Works... Each person is different with different reactions to a session. From seeing colors to experiencing heat radiating from the practitioners hands. Others experience nothing but a sense of unconditional love. The practitioner will move their hands over and around the body following the chakra system which is another way of saying the major energy centers of the body. They will feel tingling, heat, coolness and in some cases be directed towards the area that needs healing the most. Every person will feel something or not, different from the last but the effects are always the same within the mind, body and spirit. Body illnesses are only an outward manifestation that the patient has somehow on an inner level become unbalanced-that the order of the body mind and spirit has lost it's connection with everything around him/her. With a Reiki treatment the patient is brought back to a state of balance and wholeness. He/she feels a sense of harmony with life and the universe. This feeling allows one to open up to new ideas, positive thinking and new habits. 1-Just for today do not worry. 2-Just for today do not anger. 3-Honor your parents, teachers and elders.